Do you know? Do you know? Have you heard the news? "Once upon a time, years and years ago... There was a little princess, and she was very sad, for her mother and father had died. Before the princess appeared a traveling prince riding upon a white horse. He had a regal bearing and a kind smile. The prince wrapped the princess in a rose-scented embrace and gently wiped the tears from her eyes. Perhaps the ring the prince gave her was an engagement ring. This was all well and good, but so impressed was she by him that the princess vowed to become a prince herself one day. But was that really such a good idea?" This bit of back-story presents the backdrop on which all the plots of the series spring. We follow Utena as she battles Student Council Vice-President Saionji and gets engaged to the Rose Bride, Anthy Himemiya. And intern finds herself a part of something even greater. 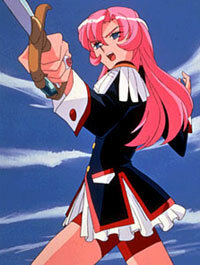 As you can obviously tell, Revolutionary Girl Utena is based on the shoujo manga by Chiho Saito and pretty much anything can happen in shoujo. The show itself is rather confusing and awkward at first. The lesbian tones that the show emits in the early episodes are virtually swept under the rug by the third episode as the many mysteries start to unravel as do the individual personalities and back-stories of each of the varius characters. The Team Rocket-ish "student council-in-the-elevator" monologue and the "water-hits-the-ring-and-unlocks-the-door" clips get old and seem like filler to waster time, much like the transformations scenes in Sailor Moon. Here is the elevator monologue so you can judge for yourself. "If it cannot break its egg's shell, a chick will die without being born. We are the chick. The world is our egg. If we don't crack the world's shell, we will die without being born. Smash the world's shell! For the revolution of the world!" Overall, these are only minor gripes because they actually tie together the show and present the passage of time, unlike the Sailor Scout's transformations that last about a second in real time. The English dub features Rachael Lillis who is probably most recognized now for her work on Pokémon. And luckily for the show, she brings the same energy to this show as she portrays the heroine Utena and Anthys playful companion Chu Chu. The only thing holding this dub down is the repetitiveness of some of the reused scenes which also feature the exact same reused dub. As hilarious as the scenes featuring Nanami's Operation: Oh! Anthy Himemiya is a weirdo...' plans, the overused use of the same dub tapes made it just drag on. But, it is cute none the less. The DVD is not at all that spectacular in terms of extra features, though the feature to view the key songs of the show (excluding the opening Rinbu Revolution sung by Masami Okui and the ending Truth sung by Rika Yumi) gives the disc great replay value. This is because all the songs are linked to the key battles and transformations of the show. The place the disc excels in is the shear fact you get the first seven episodes for a mere $40. That's only ten dollars more than most DVDs and it's well worth it for such a great series. So now, do you know? Do you know? Do you really know? Do you? Good. A definite anime classic that no Otaku should be without.